My Read Regional visit to Gateshead included the opportunity to sit at the feet of an angel. I’ve seen the Angel of the North many times from the A1 (as have 33 million people every year) but when I realised it was just up the road from my event at Birtley Library, I knew I would have to pay it an up-close visit. The scale is incredible and I love the fact that (minus the wings) it’s based on a cast of the artist Antony Gormley’s body. It’s well worth taking a detour. Gormley said that he wanted to make “an object that would be a focus of hope in a time of transition” and while there was some controversy about it while it was being built it has become a positive symbol of the North East (more than one person has told me how it ‘welcomes them home’). Not far from the angel’s feet there is a small scrubby area where people have hung mementos and objects of remembrance for loved ones who have died – the angel providing another form of hope or comfort. Birtley Library was very welcoming with coffee and an array of tasty biscuits. 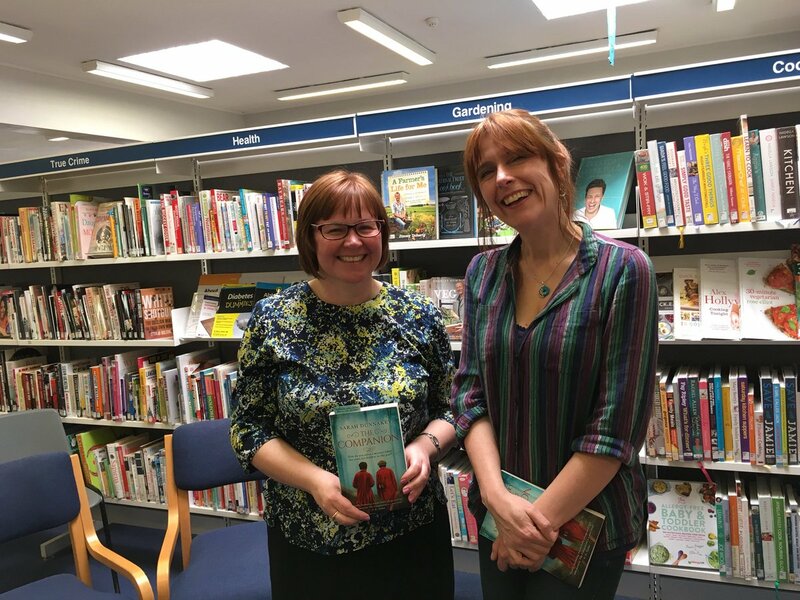 It was lovely to meet the librarians Helen and Tara who not only took photographs but live tweeted the event! I had some interesting conversations with readers afterwards while I was signing books. One woman who, like me, had family members who worked in the shipyards in the past, told me about the interchange of specialty workers between the docks in Belfast , Glasgow and the North East, which I hadn’t known about before. Useful knowledge as I have a 1930s Teeside shipyard novel planned and needing to be written! I returned home via Durham. On the recommendation of a friend I went to the Oriental Museum. It’s a fascinating collection (with very friendly, helpful staff) and well worth a long browse. I loved the Egyptology section and the art and objects from the Himalayas. I was also particularly struck by the number and variety of faces on display. This was probably my favourite object though. A very abashed looking creature, which according to the information card is an ancient sculpture of a rhinoceros made by someone who had probably never seen one. 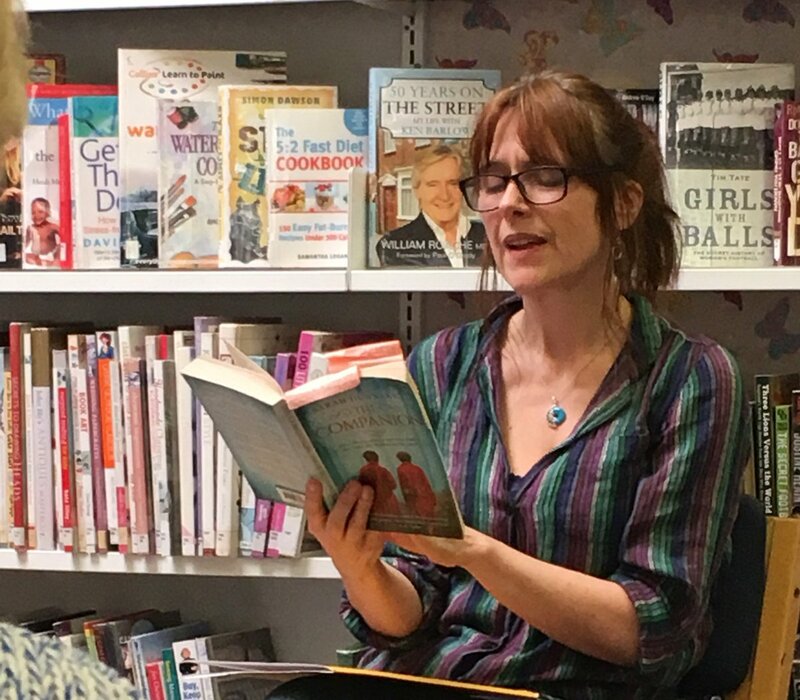 I made a quick stop in Waterstones on my way back to the train and was thrilled to discover that The Companion was the shop’s Book Club choice this month. I did an impromptu signing of all the copies in stock.